Cabin #5 rests on the highest peak of the mountain and has an amazing view of the Blue Mountains and the Appalachian Trails. Enjoy the out doors and view from two huge wooden decks, one upper and one lower while you soak in a 6 person Jacuzzi. 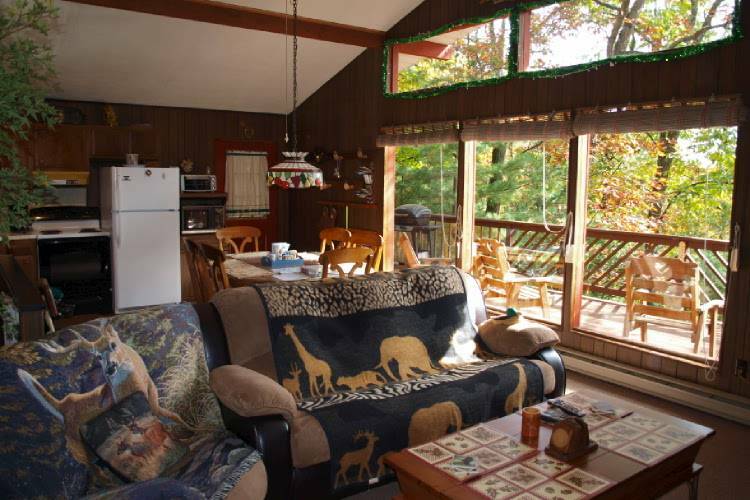 This cabin is completely secluded with only woods and wilderness that surround it. The amenities are just amazing, more than the average. It has a huge 6 persons Jacuzzi outside on the lower deck. A wood stove with a glass front to watch a cozy fire. The TV plays DVD and VHS movies. It has Digital cable with the TV guide right on the TV, High Speed Internet, Flat screen TVs in both up-stars bedrooms. Upstairs, there are two private bedrooms, 1 bath, full kitchen, dining room table, beautiful living room with comfortable furniture and all this with just an amazing view!! We make sure that our customers have a stress free vacation, so all bed linens towels, beach towels for the Jacuzzi, pots, pans, glasses, silverware, full working kitchen with a huge microwave and toaster oven so large you can put a 12` pizza in. We even provide all paper products, soaps, coffee, tea bags, salt, pepper, sugar and non-dairy packets. Downstairs, there is one private bedroom and the rest of the downstairs is for entertainment. There is a pool table, multi game table, TV, play station #2, Karaoke, dance light game and a bar table. So come and enjoy a vacation getaway with amazing views, lots of fun, and relaxation. We look forward to you as our customer! !